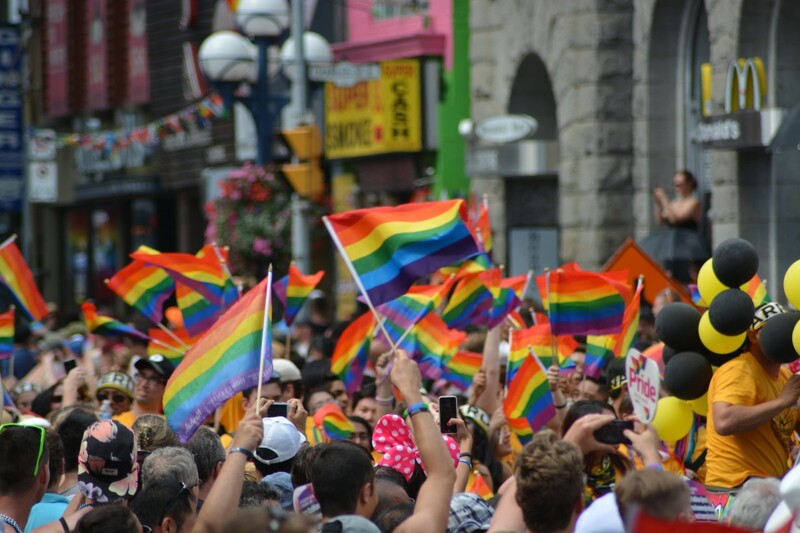 Image description: Rainbow flags waving at Pride. The decision of Parkfield Community School (in Alum Rock, Birmingham) to indefinitely suspend its teaching of the ‘No Outsiders’ programme––a part of the curriculum which teaches inclusion and diversity––is a saddening step back in the fight for equality. In capitulating to the protesters outside its gates, the school has sent a signal to young LGBTQ people across the country: your very existence is controversial and a topic of debate. It is a damaging concession to religiously motivated bigotry, which sets an alarming precedent for the capacity it has to interfere in children’s education. One charge brought against the No Outsiders programme is that it was tantamount to indoctrination. It wasn’t simply teaching about diversity; it was an attempt, as one of the protesters told me, ‘to almost recruit kids to the [LGBTQ] agenda’. What this agenda is exactly is something he could not tell me nor is it something I myself am clear of as a gay man. Is it an all-divas Spotify? Squats-only gyms? Mandatory Drag Race viewing parties? Or is it simply our arguing that our existence ought not be up for debate; nor should it be branded as deviant and other, something supposedly inappropriate for children? These children were not being taught about anything other than the validity of queer people’s existence. They were being taught that some people might have two mums or dads and that these people shouldn’t be bullied or treated any differently. These children are being actively denied a necessary part of their education, a part which teaches them the importance of respecting difference. I decided to read the legislation she mentioned and couldn’t actually find any reference to consultation with parents being necessary. But if we proceed as though some consultation were in fact necessary, let us imagine what the outcome of such a consultation might have been. If we are being idealistic, perhaps all that they would have asked is that some of the lessons were held off for a few years––still taught in primary school, but perhaps not until KS2. Now, in this ideal scenario, what arguments would have been adduced to support this position? It seems to me abundantly clear that they would have simply echoed the messages of the signs and leaflets of those protesting outside the school. They would have denounced the programme as being inappropriate, a violation of their children’s innocence. Through this, we come to the oldest of homophobic tropes––the branding of homosexuality as deviant and gay people as somehow predating on young children in a ploy to ‘recruit’ them to their ‘lifestyle’. This does two things. Firstly, it designates gay people as a group of ‘others’ and in doing so provides fecund ground for their marginalisation and stigmatisation. Secondly, it creates a climate of fear around the very existence of gay people in public positions; not only does it label them as other, it further brands them dangerous and considers their presence one that is somehow threatening to the “normal” way of life. What exactly, though, does this decision represent in the broader fight for LGBTQ equality? This concession may seem insignificant. After all, it’s one school in one constituency in one city. But we must look at what it represents, what views it legitimates. Having just celebrated 15 years since the repeal of Section 28, this decision signals that the thoughts and bigotry that underpinned the policy are far from gone. This decision supports the idea that my loving someone who is not cis or the opposite gender is something inherently hypersexual and deviant and thus inappropriate for children. In doing so it derides the idea of queer love and devalues the loving relationships many queer people have. It appears to rob us of the capacity to have this supposedly integral part of the human experience. It echoes that horrific piece of legislation which referred to homosexuality as ‘a pretended family relationship’; as this idea oppressed LGBTQ people then, the implications of this decision may do so in the future. These children are being actively denied a necessary part of their education, a part which teaches them the importance of respecting difference. But it’s more than that. In doing this, they have furthered the isolation that LGBTQ kids feel when growing up. To never have your existence normalised during your education, to have it branded as age-inappropriate. This is something LGBTQ youth up and down the country will see and internalise, and contributes to the mental health crisis amongst LGBTQ youth. While this is not a specific criticism of Muslims––there were conservative Christians and ultra-orthodox Jews at the protests and showing support online––there is an extra dimension to be noted regarding the role of Muslims and Islam in the debate about Parkfield. These protests and the frankly disgusting homophobia of the signs and leaflets feed into a narrative of incompatibility between Islam and “the West”, that one cannot have affiliation to both. Despite their own homophobia, this provides more ammo for those on the far-right; it helps them to vilify and ostracise Muslims and only further whips up hatred against already vulnerable communities. That is not to absolve anyone of guilt, but it is simply to note that much of the coverage of this will stress the fact of the protesters’ being majority Muslim. And while it is a deeply-rooted problem and one of which I am fiercely critical in the community, in the wake of the Christchurch tragedy we must be careful of our words, and of who can use and abuse them. So yes, see this as religiously motivated homophobia and call it out as that. Then, platform the voices of queer Muslims to do the rest. We must not allow religiously motivated homophobia to not only impede children from getting a well-rounded education but also to contribute to a climate of stigma and isolation for the LGBTQ youth of today. Having put that disclaimer, I believe the response of prominent Muslims to this has been shameful; it has been an attempt to absolve the community of responsibility and an attempt to ignore the true problem. This is clearly evidenced in Salma Yaqoob’s responses during her appearance on The Big Questions. Not only did she betray her supposedly liberal views by calling one’s being gay a ‘lifestyle’, she also continued to back up the idea that there was some necessity for consultation and sought to obfuscate argument about whether or not there were issues about the content––a cowardly tactic to avoid any discussion of the homophobia of the protests. No number of mawkish displays of empathy towards the plight of LGBTQ individuals will suffice if it is not backed up by resolutely supporting them when there are clear attempts to further isolate them in society. This obfuscation of the issues and shifting of the debate is also what disappointed me about Mahmood’s response. While I would like to believe she did in fact care about the possible procedural transgressions at Parkfield, something tells me it was little more than strategic politicking. She helped disguise the problem of homophobia at play here and instead chose to pander to what is obviously a core section of her voter base. And in doing so, she threw queer people under the bus––ironic considering much of Birmingham’s Gay Village is also part of her constituency. The decision made by Parkfield sets a concerning precedent. We must not allow religiously motivated homophobia to not only impede children from getting a well-rounded education but also to contribute to a climate of stigma and isolation for the LGBTQ youth of today. There will undoubtedly be LGBTQ children in Parkfield, who have either already realised this or will do so soon. It is for those children that I am most concerned.